Kumusta? I have discussed so many things in my previous entries: simple grammar lessons, cultural tips, and language tips. Now, let me give you additional help towards language learning. Each of us is different and no two people are alike; what works with Adam may not work for Eve. Before setting out a language program, know thyself first: Know what technique would work for you and remove those that don't. There are many new methods and techniques that can make learning fast and easy. Do you still remember those days when you would dread recitation drills and language electives because your teacher's techniques were not effective for the kind of learner that you are? I too had experienced such torture. But those days are gone. In fact, there are more modern methods that teachers have found to work well if they match with the student's capabilities. 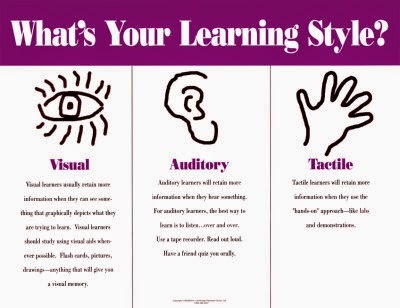 Know thyself: Are you a visual learner? An audio learner? A tactile learner? To know this, you have to review your previous experiences when you were learning something. Try to recall what method helped you in learning driving? in cooking? in mastering the multiplication table? How would you appreciate something faster? Is it through hearing? Watching? Touching? Doing? Once you have done this and determined what kind of learner you are, you can start setting up a plan of action. Mao ra (that's all) Ayu-ayo. Kita ta sunod.